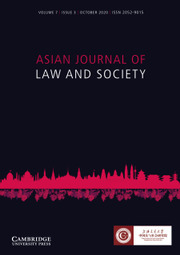 The Asian Journal of Law and Society (AJLS) adds an increasingly important Asian perspective to global law and society scholarship. This independent, peer-reviewed publication encourages empirical and multi-disciplinary research and welcomes articles on law and its relationship with society in Asia, articles bringing an Asian perspective to socio-legal issues of global concern, and articles using Asia as a starting point for a comparative exploration of law and society topics. Its coverage of Asia is broad and stretches from East Asia, South Asia and South East Asia to Central Asia. A unique combination of a base in Asia and an international editorial team creates a forum for Asian and Western scholars to exchange ideas of interest to Asian scholars and professionals, those working in or on Asia, as well as all working on law and society issues globally.